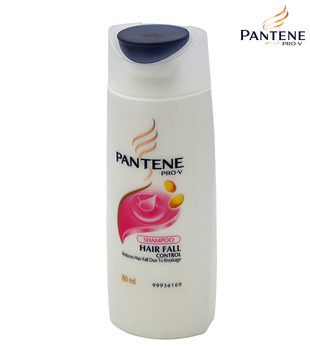 Pantene Hair Fall Control Shampoo reduces hair fall due to breakage. Pantene Pro-V formula nourishes the hair root and helps strengthen hair. For better results, use together with Pantene conditioner. Massage onto wet scalp/hair gently. Rinse thoroughly. For best results use everyday. Because of my vain-ness since young (14 years old) where I wash my hair everyday even when I don't feel it's dirty (because I love the smell of it), my scalp is kind of oily now. This means I have to wash my hair everyday now, and I can't use moisturizing shampoo for my hair, because that would cause oiliness for my scalp. I've always been very picky with shampoos, there are indeed some shampoos that I can't use because it makes my scalp oily, or my hair fall worse. The reason why I decided to try Pantene was because I saw in many magazines, where there are people who are actually loyal customers of Pantene, furthermore Pantene has been around for quite long now, so I thought, why not give it a try? I have actually tried Pantene Hair Fall Control before when I was younger, and back then it did work for me, but after using few times I noticed it made my hair fall worse, so I stopped. But this was many years ago, and now they have new packaging, and I assumed there is also a new formula. The texture is cream based and it lathers into foam pretty well, which makes it easier for me to wash my hair. The smell is awesome, it has a fruity scent. I loved the feeling when I shampooed and rinsed my hair because it made my hair feel smooth and untangled. Unfortunately, it did not help with my hair fall, in fact it made it worse like before, which I was kind of disappointed. Even after shampoo and conditioner, when I combed my hair, a lot of strands came out (More then usual I mean). As much as I like the smell, but it's a no for me, however doesn't mean that it doesn't work me means it doesn't work for others. So you girls can give it a try by purchasing the 90ml bottle @RM4.90 from Watsons.